As of 4/10/2011, I have discovered in excess of 50 tax documents containing any given combination of Social Security numbers, credit card information, names, addresses, tax IDs, and phone numbers being made available online. However, unlike recent leaks of email addresses and password hashes being made available due to hackers compromising systems, these documents are being unknowingly made freely available to prying eyes by the very owners of said information. To clarify, these are tax documents as they have been/will be submitted to State and Federal government: Names, addresses, income, phone numbers, credit card numbers (stored from e-filing), and worse of all, Social Security numbers. The latter is the most detrimental of all not just because of the individual filing their taxes having their identity potentially stolen, but because of individuals who have children that they use for tax credits. 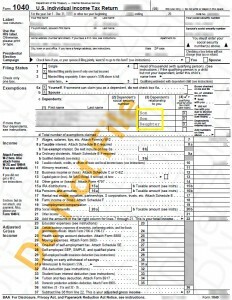 What you see there is one page from a 1040 form containing 5 names, 5 Social Security numbers, one address, and total yearly income. This whole family — husband, wife, and three children — is potentially at stake for identity theft, and that is if it hasn’t already happened since this particular document has resided on their Web site for quite a while (as noted by the date shown for when the file was uploaded to their site). The article goes on to say what can be done to protect your information from identity theft. I suggest that we all take note of their suggestions - especially in our electronic filing of this year's tax returns. Have you ever had your identity stolen? Any advice?